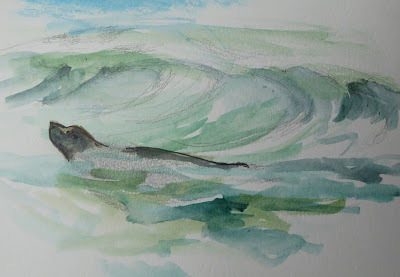 I will be teaching a special new class called Creative Nature Journaling this summer at the Michael Landon Community Center at Malibu Bluffs Park. "To see a wren in a bush, call it "wren," and go on walking is to have (self-importantly) seen nothing. To see a bird and stop, watch, feel, forget yourself for a moment, be in the bushy shadows, maybe then feel "wren"— that is to have joined in a larger moment with the world." —Gary Snyder, Language Goes Two Ways, 1995. I've kept a nature journal for many years, and I am delighted to have the opportunity to teach a course on creating one through the City of Malibu's community classes program. I carry a small journal and some simple art supplies everywhere I go. This sketch was done in the space of a few minutes between work events using a couple of water-soluable colored pencils and a Sharpie pen. Leonardo Da Vinci is regarded as the most celebrated nature journalist, recording his observations in painstaking detail and spectacular profusion. However, you don't need to be an artist or a scientist to keep a nature journal, although there are elements of art and science involved. All that is required is curiosity and the time to observe and experience nature. 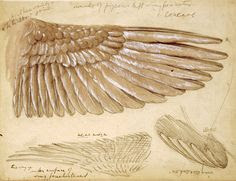 Delicate and detailed sketches of bird wings and feathers from the journals of Leonardo Da Vinci show the artist's meticulous attention to detail. 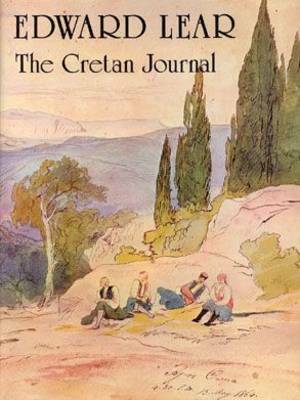 Well-known natural journalists include Lewis and Clark, John Wesley Powell, John Muir and Mary Austen all kept nature journals. So did Beatrix Potter and Edward Lear. 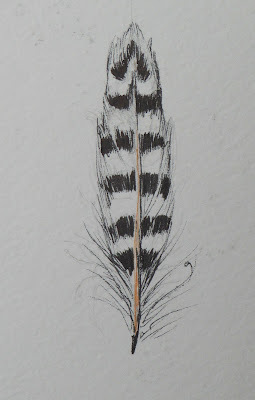 A sketch from the journal of John Muir. Edward Lear, best known for his nonsense poems, kept detailed journals of his travels that often featured drawing of plants and animals, especially birds. He is justly famous for his scientifically accurate illustrations of parrots. 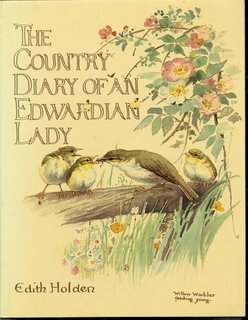 Edith Holden (1871-1920), made famous through the posthumous publication of The Country Diary of an Edwardian Lady in 1977, filled her journal with delicate watercolors simply for the joy of recording the seasons. Edith Holden was a largely self-taught artist who kept a nature journal. It was published decades after her death and received much acclaim but was created as a private record of the artist's joy in nature, with no thought for posterity. Writers Diane Ackerman, Annie Dillard, and Barry Lopez, and naturalist Bernd Heinrich are contemporary nature journal keepers, but all kinds of people keep a nature journal. 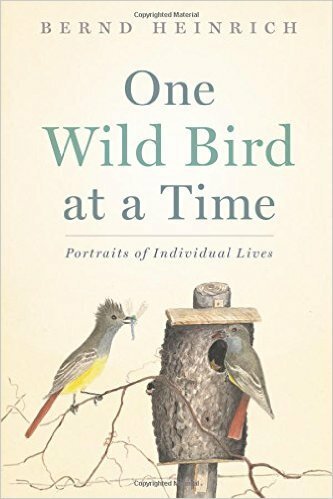 Biologist, bird behaviorist, and nature journalist Bernd Heinrich takes what he calls a "hands-and-knees" approach to observing nature. A Google image search will turn up an amazing range from the drawings of grade school children to pages that resemble the jewel-like illuminations in a medieval manuscript. The one thing they share in common is an interest in the natural world. 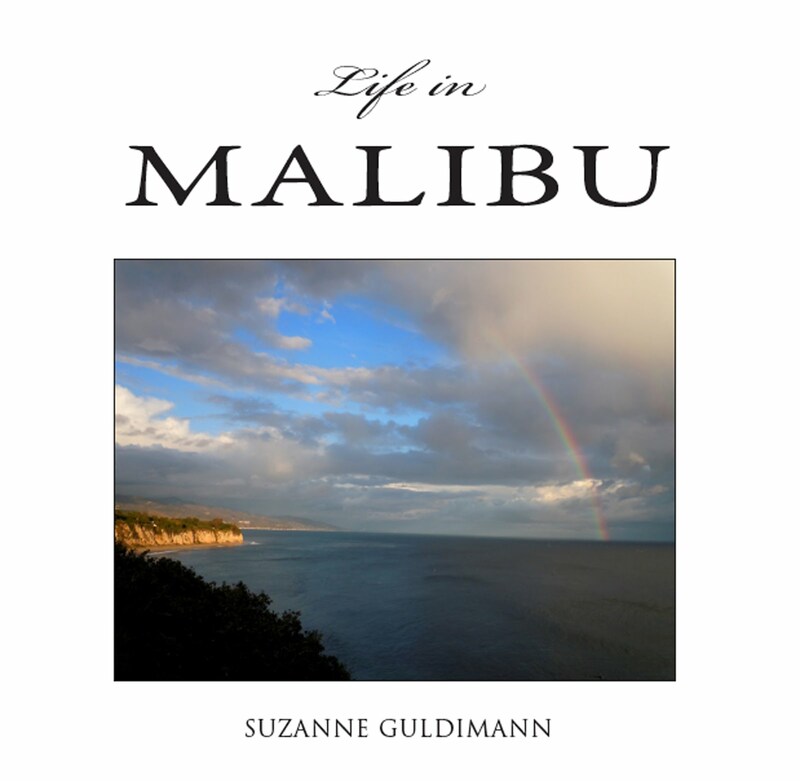 Here in Malibu, the natural world is never more than a few steps away. Most of us see—or hear—mourning doves every day in the spring. 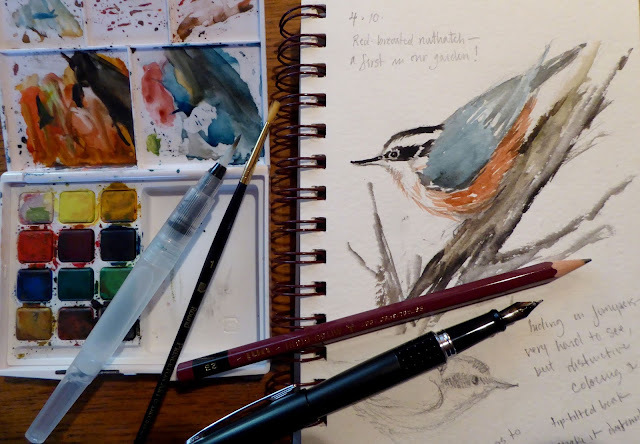 Adding a sketch of one to the journal is an opportunity to really look at this bird, observe its colors, shape, habits. I find that drawing fixes the subject in the mind in a way that observation or even photography cannot match. Capturing a fast-moving sea lion is half observation and half drawing on memory. 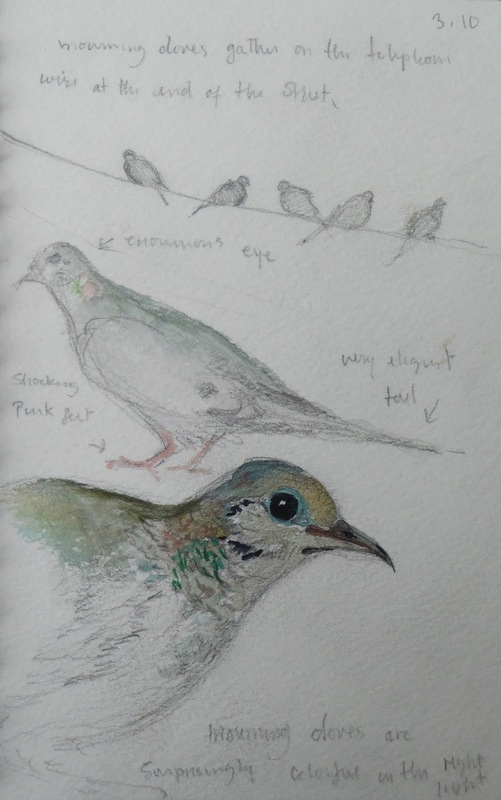 It doesn't matter if the sketches in a nature journal are detailed or rough, as long as the memory is fixed, the observation recorded, that's all that matters. 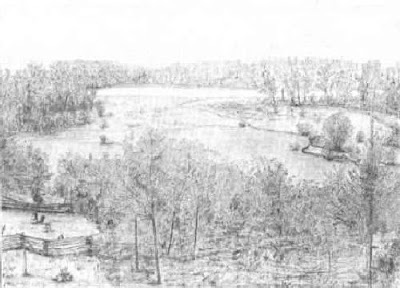 In the class, we'll use watercolors and pencil to chronicle some of the plants, animals, and landscapes at Bluffs Park. We'll also explore the art of observation—sharping the ability to describe what we see. I think it will be fun and useful, whether you are new to nature journaling or have kept a journal for years. My journal, especially in springtime, is full of birds, but almost anything can be the subject for a nature journal. Poetry can evolve out of written descriptions. Some journal-keepers press objects like leaves or flowers between the pages. Sketches might range from stick figures dashed off with a ballpoint pen to intricate pen and ink drawings. Watercolors might be used to match the exact colors in a leaf or feather, or in loose, abstract washes that attempt to capture the colors of the sky or the rush of birds in flight. 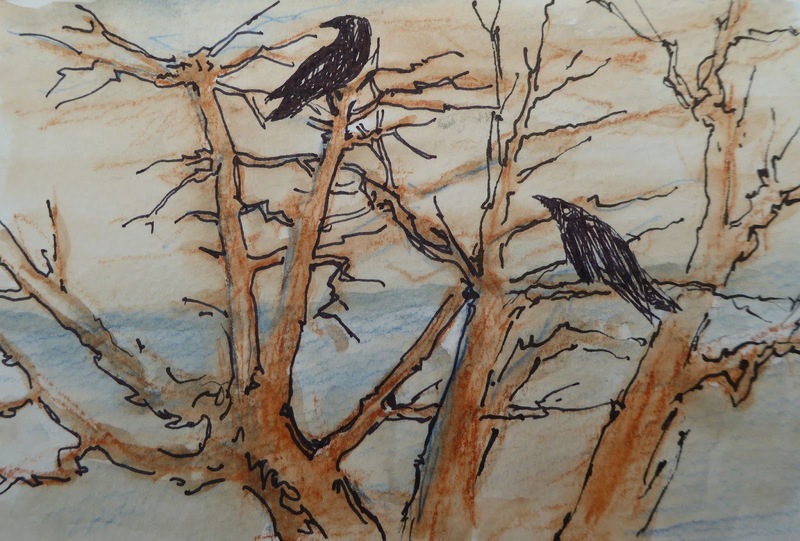 The Creative Nature Journaling class is offered in two four-week sessions on Wednesdays, 10 am-noon. The first session is June 15 to July 6; the second, July 13-August 3. There is an $80 fee per session, and a $25 material fee that includes all of the necessary art supplies. I would be delighted, dear reader, if you would join us. More information, including the registration form, is available on the City of Malibu's Parks and Recreation website, here.